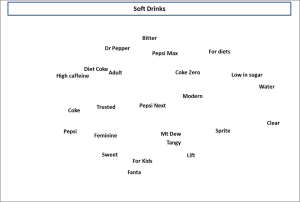 Multi-attribute perceptual maps (or MDS maps) will show multiple brands and multiple product attributes at the same time. They appear more complicated than the basic two dimensional perceptual maps that are typically taught in an introductory marketing class. However, once you know how to interpret a multi-attribute perceptual map you will find that they are more helpful and insight than the basic mapping technique. To make an overall similarity perceptual map. Let’s start by viewing a multi-attribute perceptual map (as was produced by the template). (You can click to enlarge). 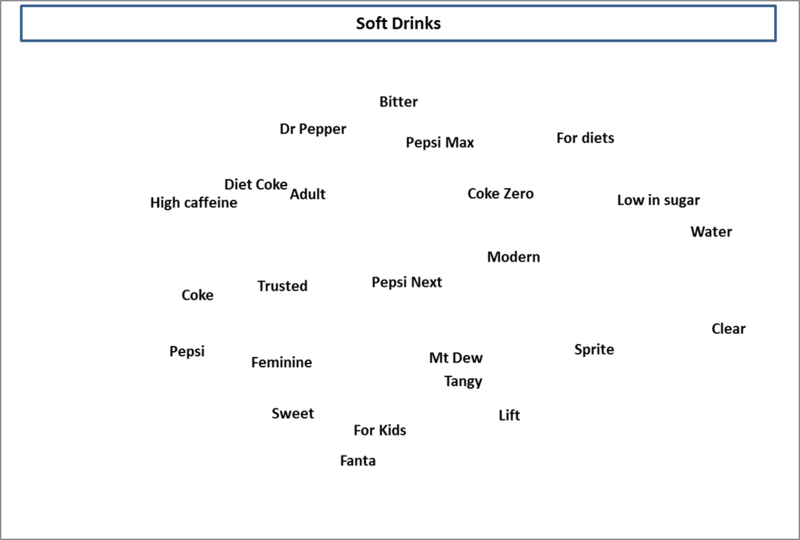 As you can see, in this example for soft drinks, there are 12 brands AND 12 attributes mapped at the one time. While this may look complex at first, there is a lot of information that is available. What you need to look for is the distance between the attributes themselves, between the brands and between the brands and the attributes. Typically, this sort of map would be constructed using market research image data – which means that the map highlights perceptions of consumers and how they perceive the marketplace. Here is the same multi-attribute perceptual map, but this time a series of circles have been added to highlight some of the key points from the map (You can click to enlarge). Underneath the map a list of findings that a market analyst could make based upon this perceptual map. There appears to be clear competitive sets within the market (e.g. 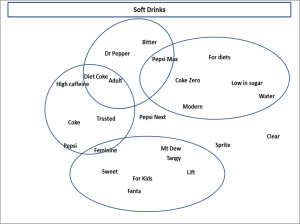 Coke and Pepsi – Sprite, Lift, Mt Dew, Fanta). We can tell this because these brands are positioned relatively close to each other on the map. Most brands have clear association with a few attributes (e.g. 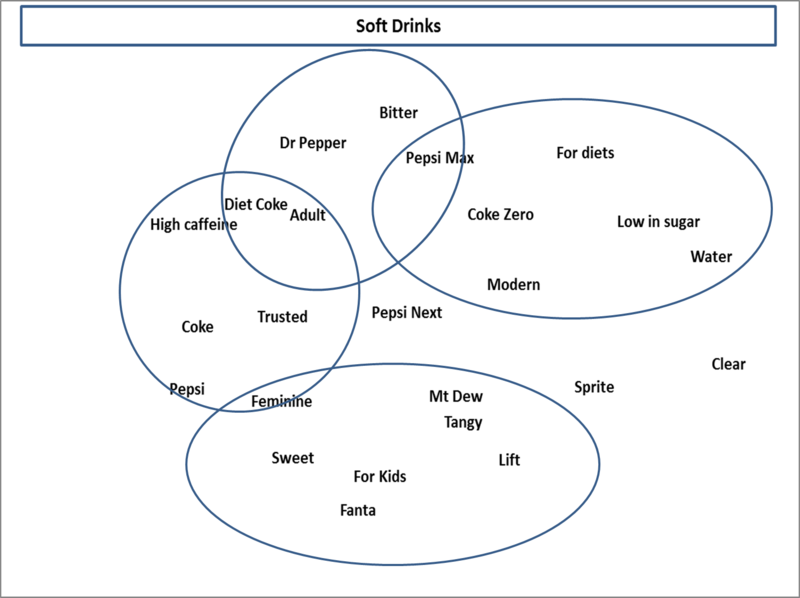 Fanta with for kids’ and ‘sweet’ – Dr Pepper with ‘bitter’ and ‘adult). Again we can tell this because these brands sit quite close to these particular product attributes. Consumers seen to consider some product attributes as quite similar. An example here would include ‘sweet’ and ‘for kids’. Please keep in mind that this overall example is so marketing students can get the sense of how to interpret a multi-dimensional perceptual map and make not fully reflect consumers’ perceptions at a particular point in time or for a specific country.